Yesterday we looked at three opening sentences of classic pulp stories. Today let’s take a closer look at three contemporary short stories published in Issue 9 of Cirsova Magazine. One of the best of the current crop of short fiction periodicals, Cirsova makes for a great case study because it publishes a wide variety of genres, features some of the best unheralded talent working today, and because I’ve never published anything with them, so I can maintain a thin veneer of objectivity about the stories within. The use of adjectives in this sentence works well. Though the road is rutted (well traveled), it meanders (is in no hurry), shaded (and out of the cleansing light of the sun), and old (as evidenced by the mighty oaks. The threat of the oaks demonstrates this is no place for the unwary, so we have an intimation of a threat right out of the gates. That’s a good sign. Trouble ahead calls the reader forward. A solid opening. Here’s a counter example that could have used a lot more descriptive words to paint the picture. It violates the “show, don’t tell” rule, but we’ve got a limited number of words to use and a strong start demands unsubtle tactics. You’ve got to come out swinging, not playing coy with the image you’re painting in the reader’s head. Is the knight tired or proud? What sort of monastery does he face? It should loom over him if it houses a dark secret, or should beckon him with bright lights shining from every window. Details are your friend at this stage, provided they are terse and provide some foreshadowing of what is to come. I quite liked the story that followed, but this sentence does little more than confirm the setting and the genre. To be fair, S.K. Inkslinger starts off the next tale, The Bejeweled Chest, with even less. Oh, shut up, Jon – this is no time for pedantic grammar Nazi-ing. If you break a rule well, then you wrote well, full stop. As a first sentence, this works fantastic. It’s just four words, so you get through it almost too fast to realize what happened. 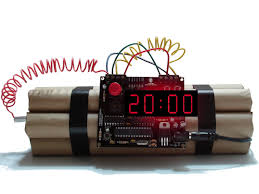 And yet in those four words a timer started ticking down to the detonation of the plot bomb. We’re stuck in a tale with a protagonist who has already faced danger and lived, but there’s no telling how long he or she has to get out of trouble. We don’t know the genre, we don’t know the mood. All we know is that we have to move fast. This is classic page-turning prose. Well done. One thing that I like about all three of these sentences is that they all eschew the all-too-common trope of “NAME VERBED.” That’s an empty introduction to snoozeville. Too many stories force a name into the first sentence. There’s plenty of time for names once we’ve set up the gameboard. Give the reader a picture first, set some stakes, get things in motion. Once you’ve done that, then you can start affixing labels to personalities and places. If you haven’t built the structure of the story, the labels have nothing to hold them – they just linger there in the mind, hanging in empty and weightless space. With every passing moment, the reader’s interest in finding a post to stick them to will wane, so don’t give them an excuse. Make them wonder who this guy is first, then give them the name. Draw them in and make them ask for a name before you give it to them. Tomorrow, we’ll look at the next three sentences. In the meantime, consider how the rules of first sentences can be used throughout your stories. How every sentence can lead the reader onwards, rather than hang in space while it waits for necessary details to emerge later on in the narrative – even one sentence too late is still too late. Oh, and Happy Halloween! 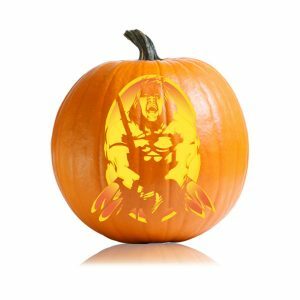 Here’s a Conan Pumpkin Stencil for your pulp pumpkin.